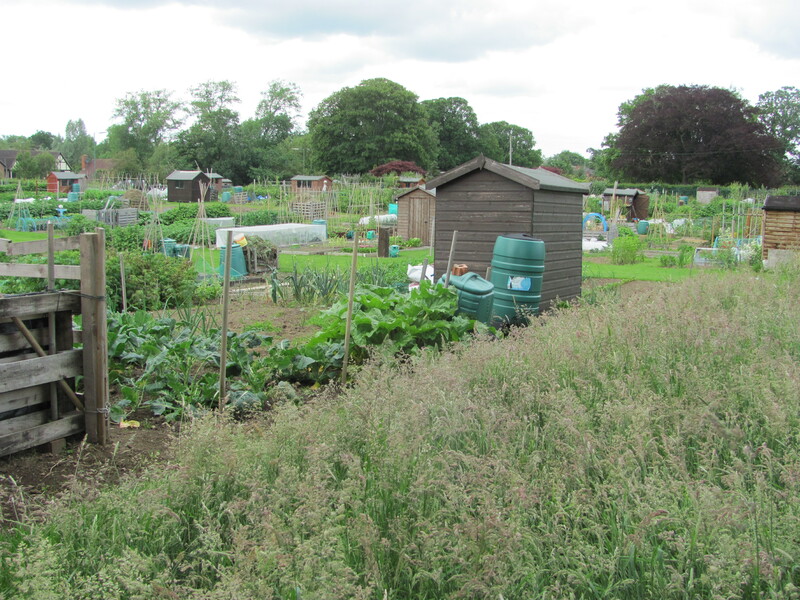 Here we are at the half way point of the year in the June allotment wanderings. 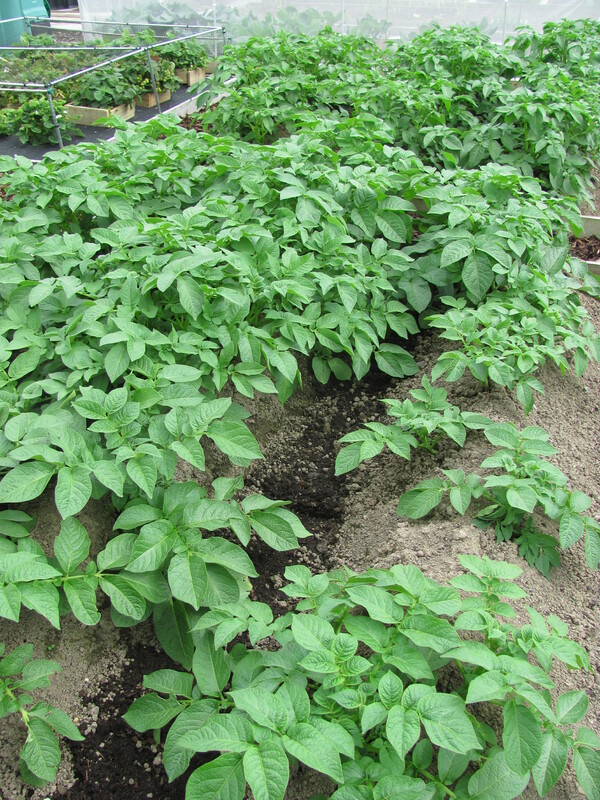 As usual we shall start on our own plot to see what has been going on. 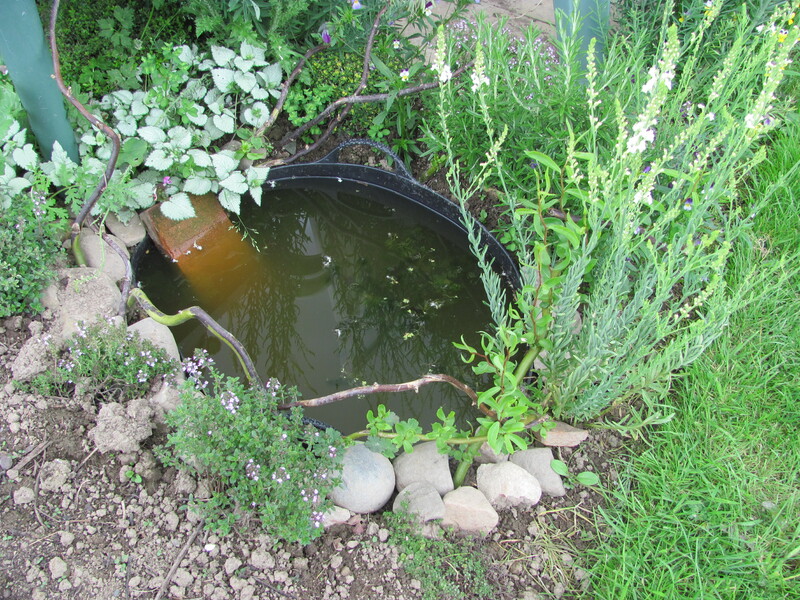 Our little wildlife pond is beginning to look more established and the tadpoles are growing well. 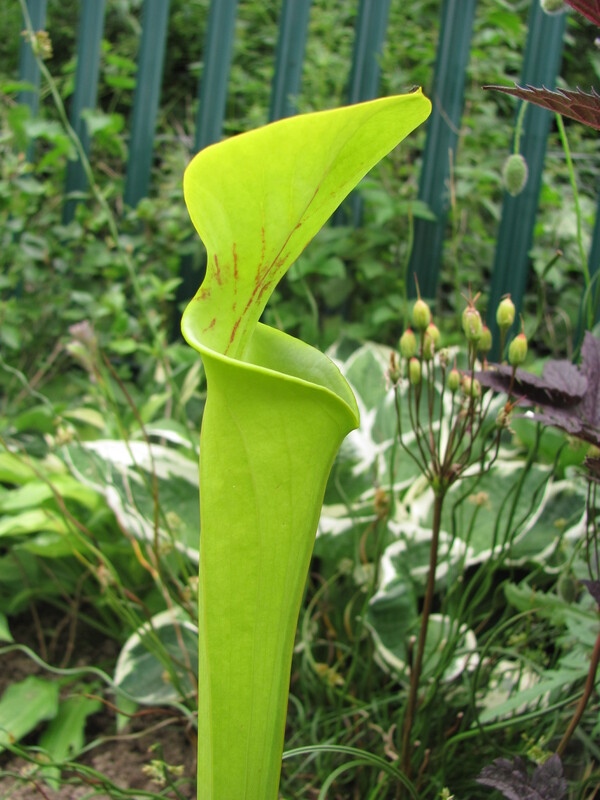 We hope the frogs stay on our plot and eat up all the slugs. As you can see we provided a little wooden ramp to help them get in and out of the water. 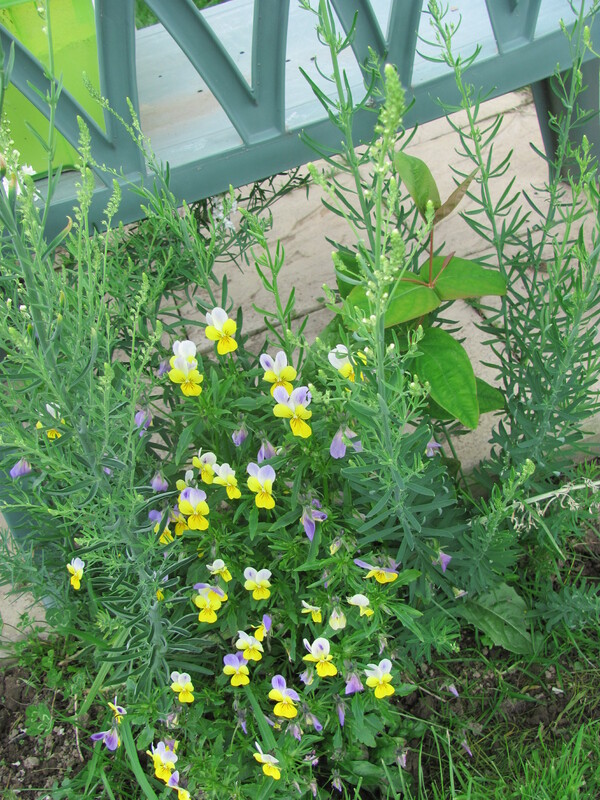 Heartsease self seed around the plot sometimes landing in suitable places arriving in a wide range of colours. 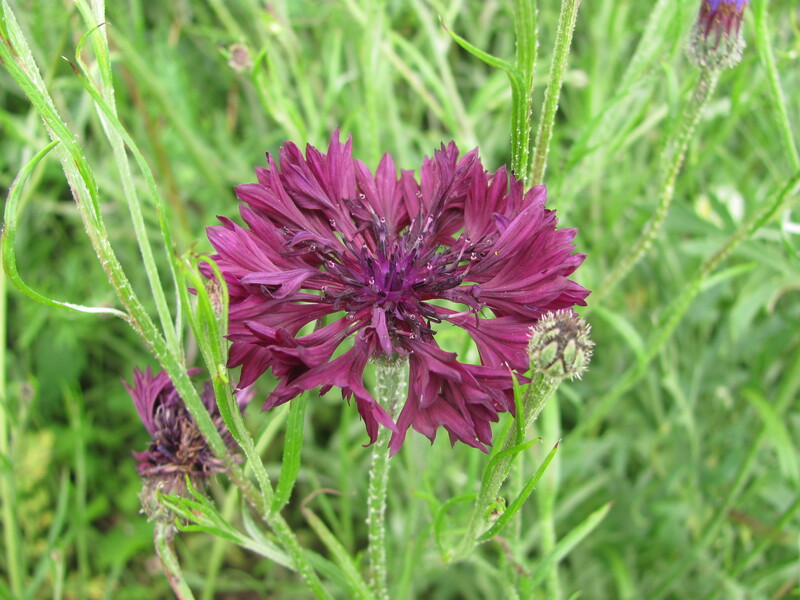 This one seeded into the soil behind the green bench. 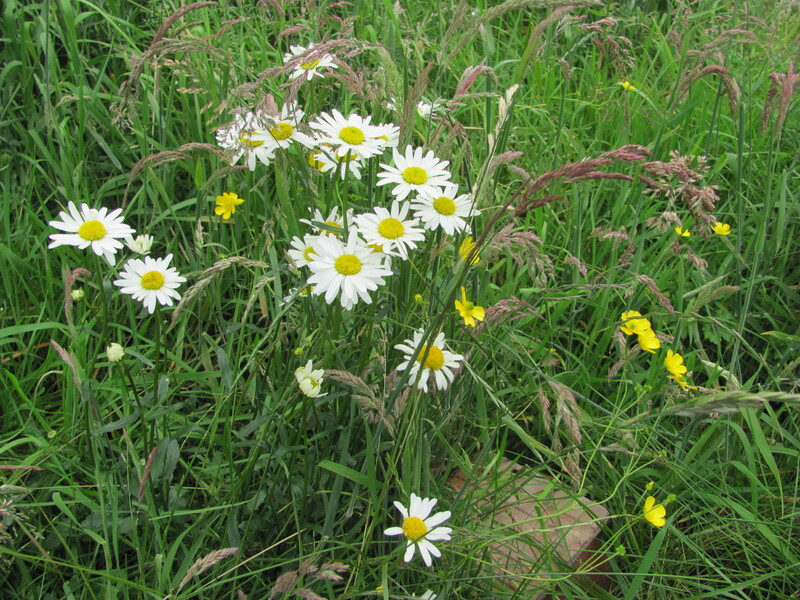 Our strip of wildflowers, a little piece of meadow, is beginning to flower. 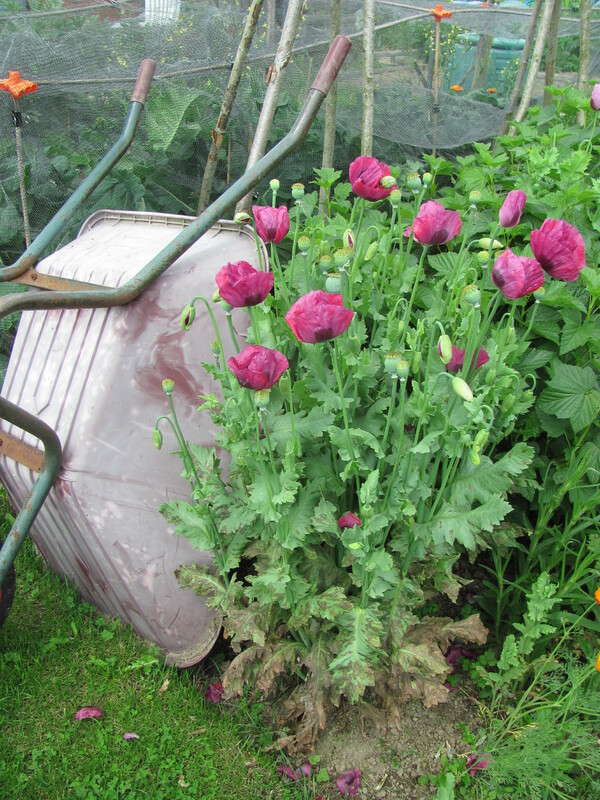 This Opium Poppy surprised us with its deep pink coloured petals. 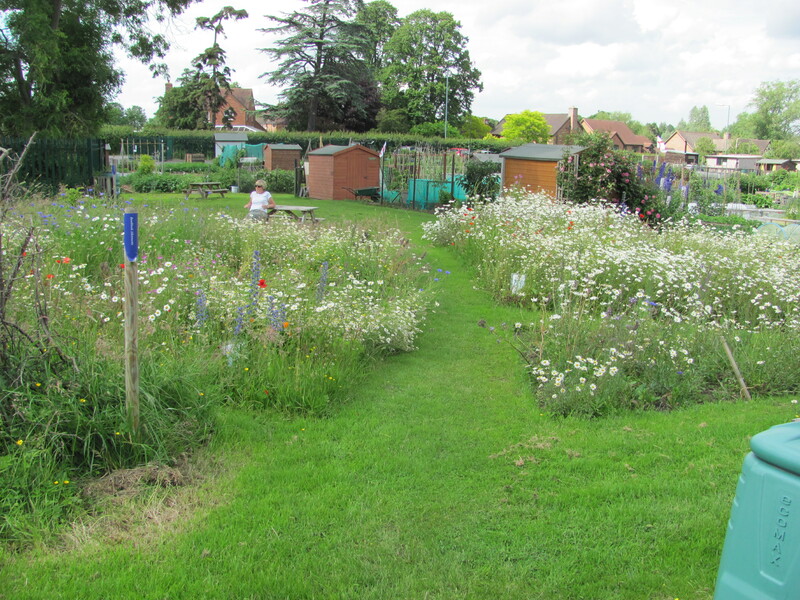 Just as flowers feature strongly on our own plot so they do on other members’ plots and in the Green Space borders. 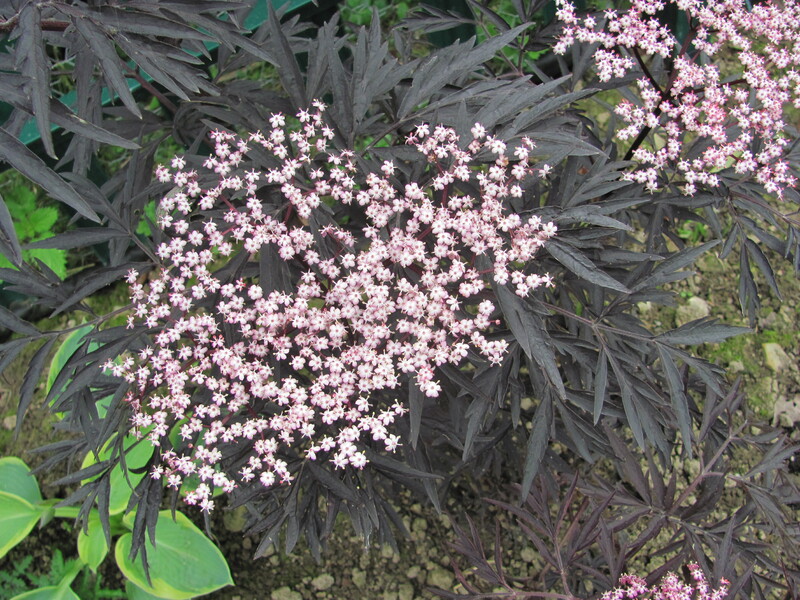 In the Autumn Garden Achilleas are the stars. 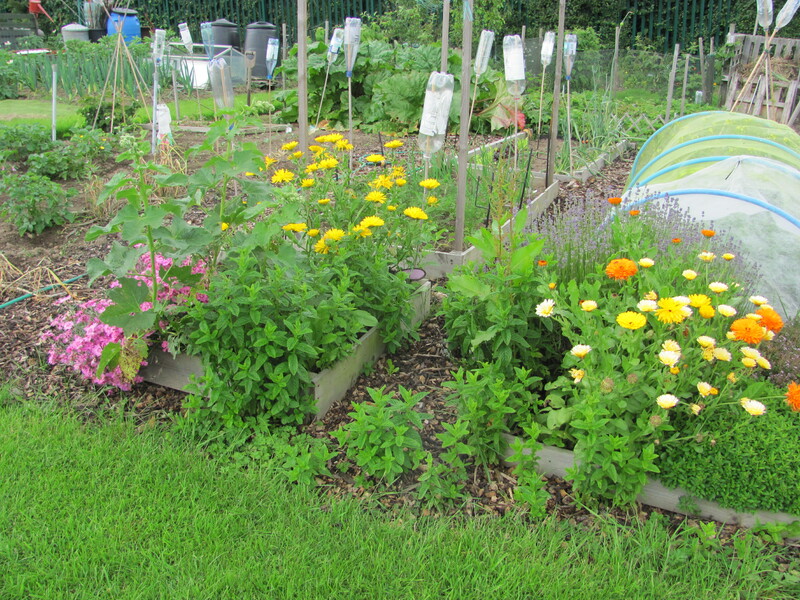 Calendulas feature on many plots as they look so good, and work hard as part of companion planting helping to attract beneficial insects. 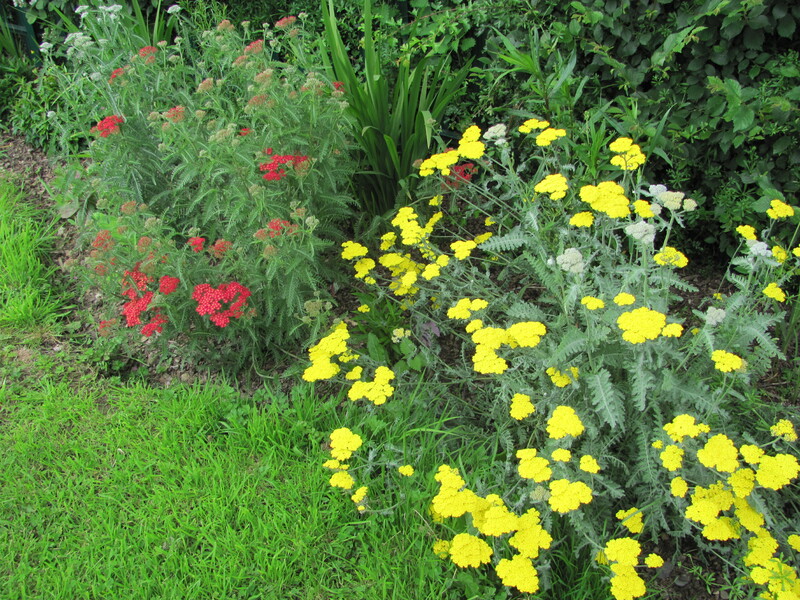 Our first “Buddleja Bed” planted to attract wildlife now looks colourful and full of life. 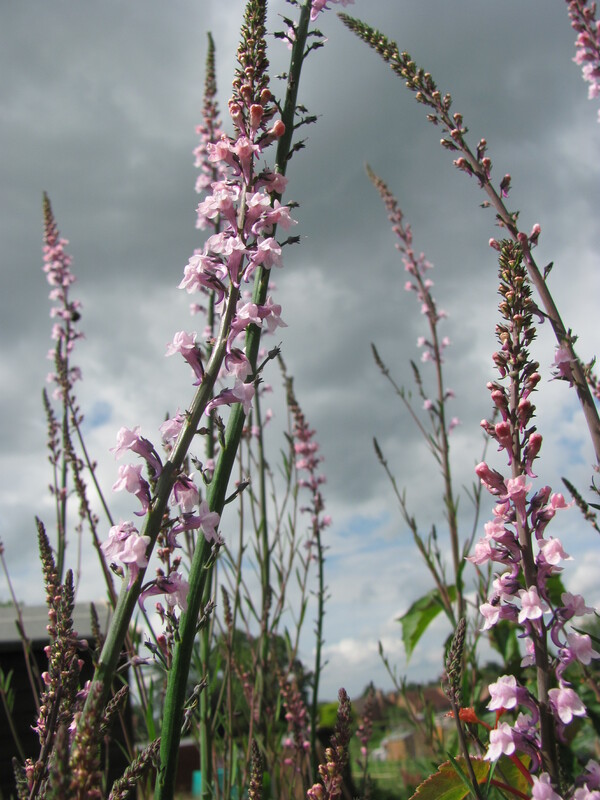 After losing some of our Buddlejas in the dry last year when Shropshire experienced months of drought after two extremely cold winters, the name for these borders currently looks a little inappropriate. 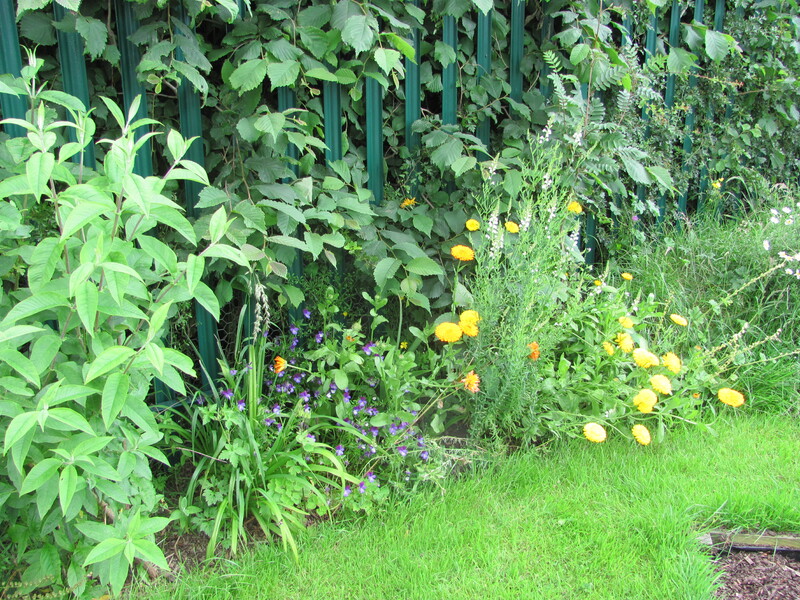 Our wildflower bank sloping up towards one of our orchards is now looking more established as we have added plants that members have donated to add interest. 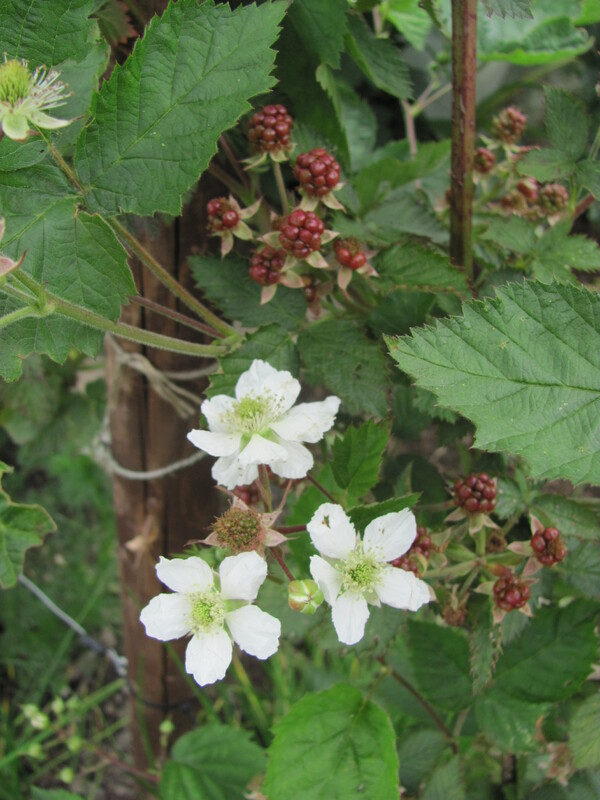 The Edible Hedge is now fruiting providing sustenance to birds and small mammals. 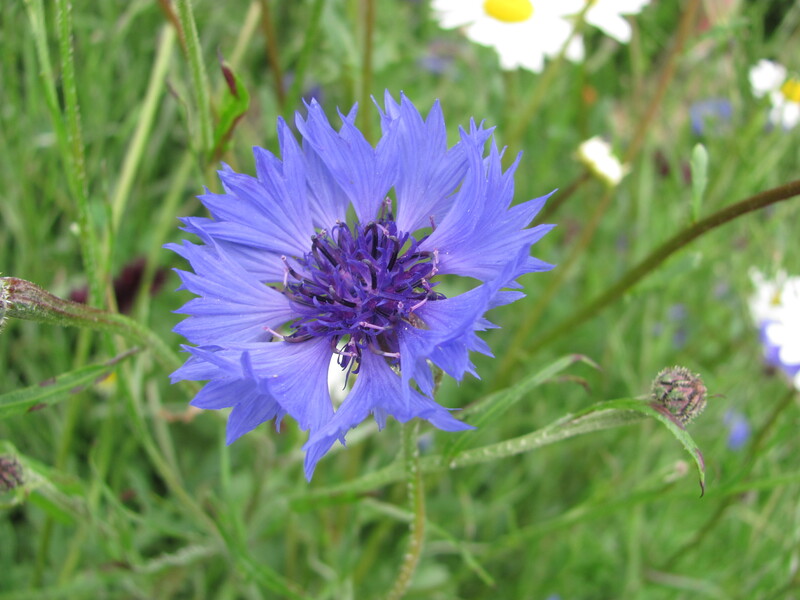 Flowers in the borders at the base bring in bees, butterflies and beneficial insects. Beetles enjoy the long grass and we like them to be there as they feed on slugs. 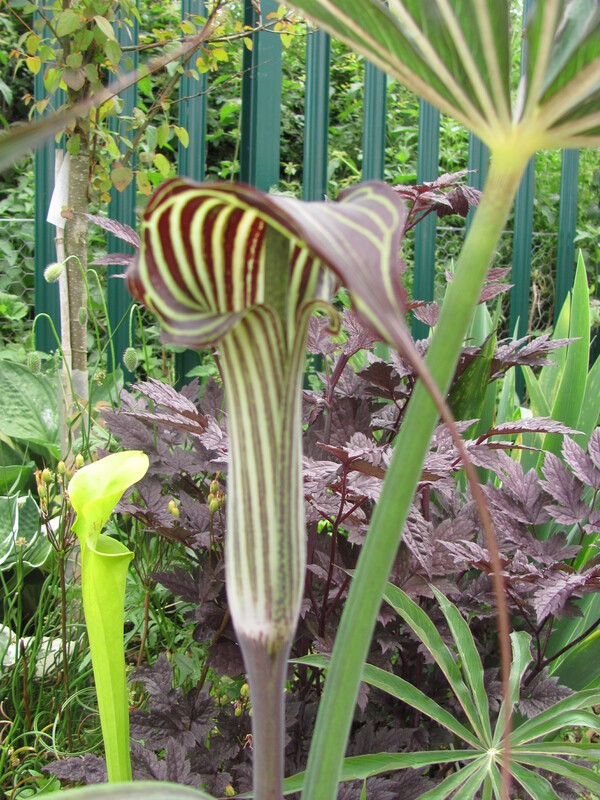 The most colourful garden on site at the moment is the Spring Garden which still displays much interest as we move into the summer months. 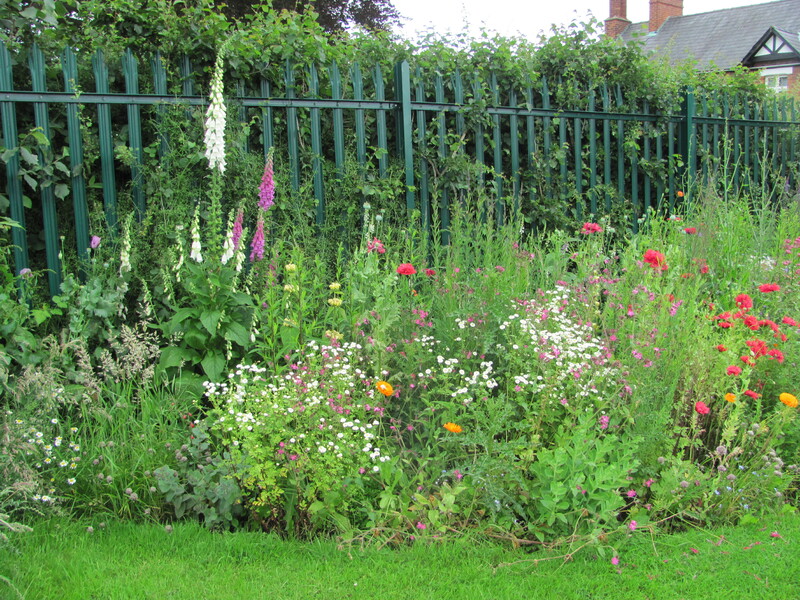 This garden is maintained by volunteers, Jill and Geoff who spend many an hour planting, dead heading and weeding. 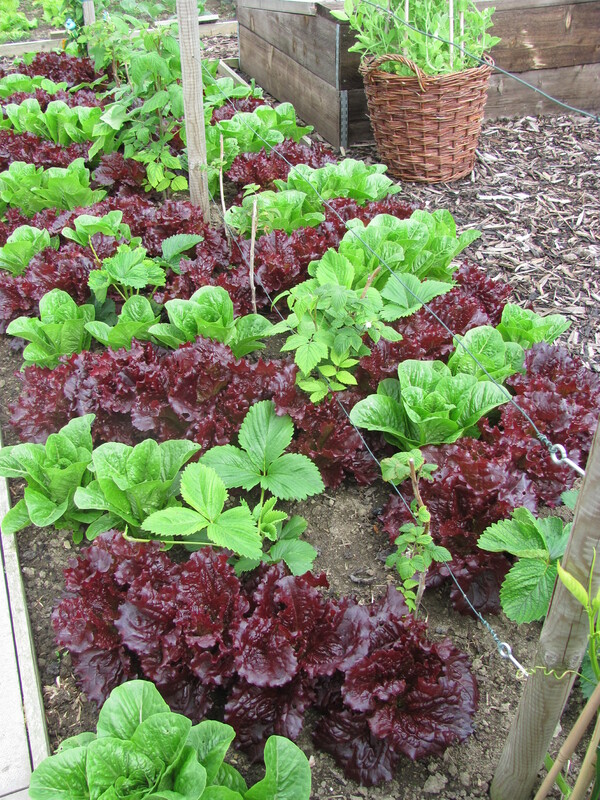 Geoff and Jill’s plot is renown for its weed free neatness and precision planting. 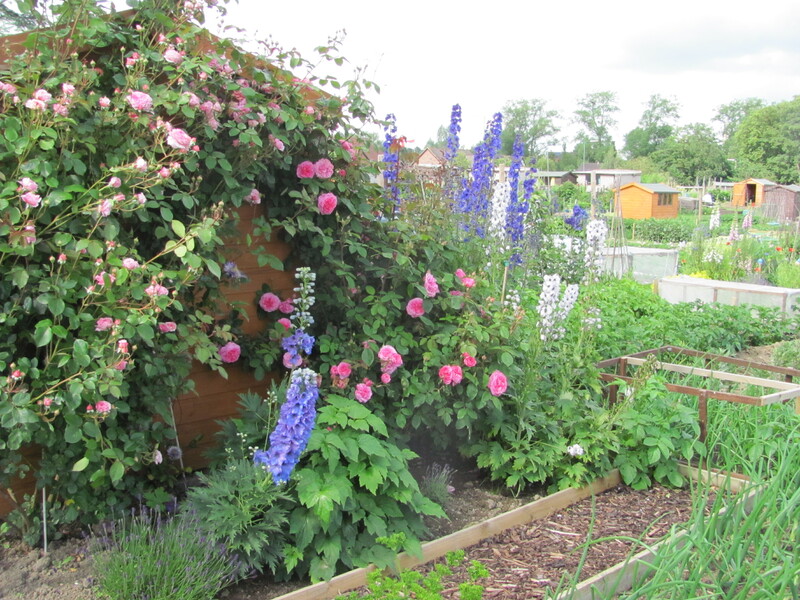 The Summer Garden is not to be outdone though as the roses are coming into flower and beautiful scents greet us as we sit on the nearby picnic benches. 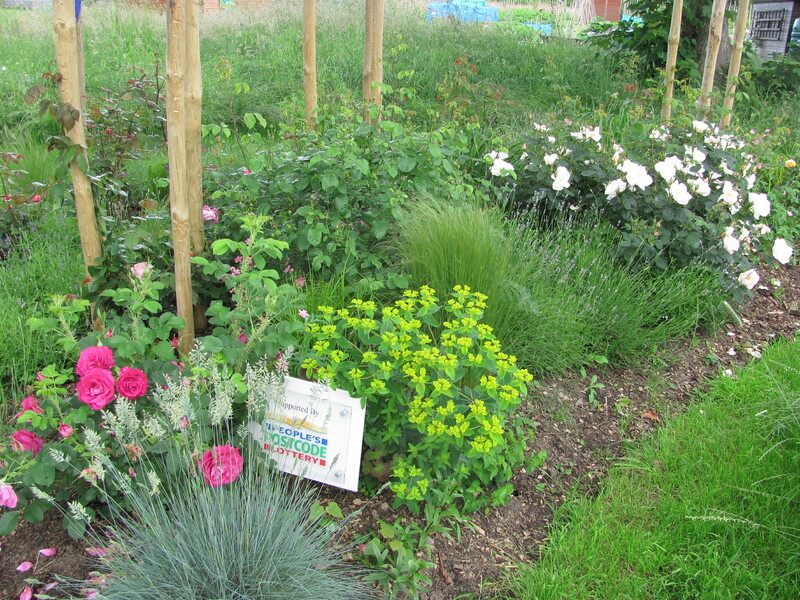 The lavenders, geraniums and grasses planted between the roses add further interest and textures. 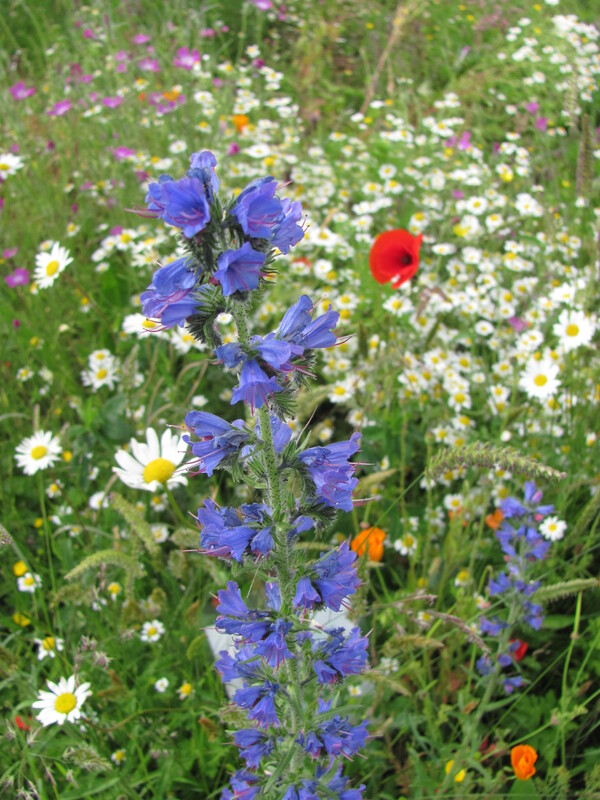 As June moves towards July our meadows really come into their own. 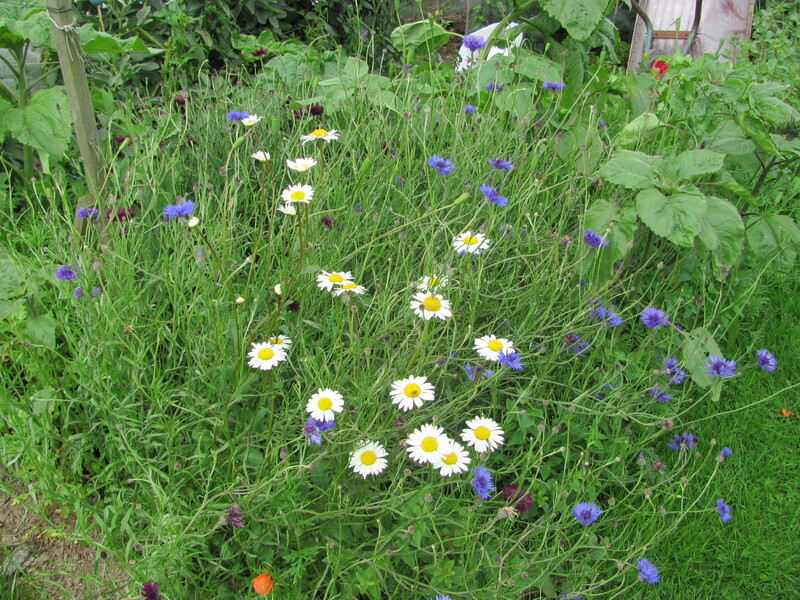 Plot holders love to walk through them and a wide variety of birds, bees, butterflies, grass hoppers and every sort of mini-beast visit. 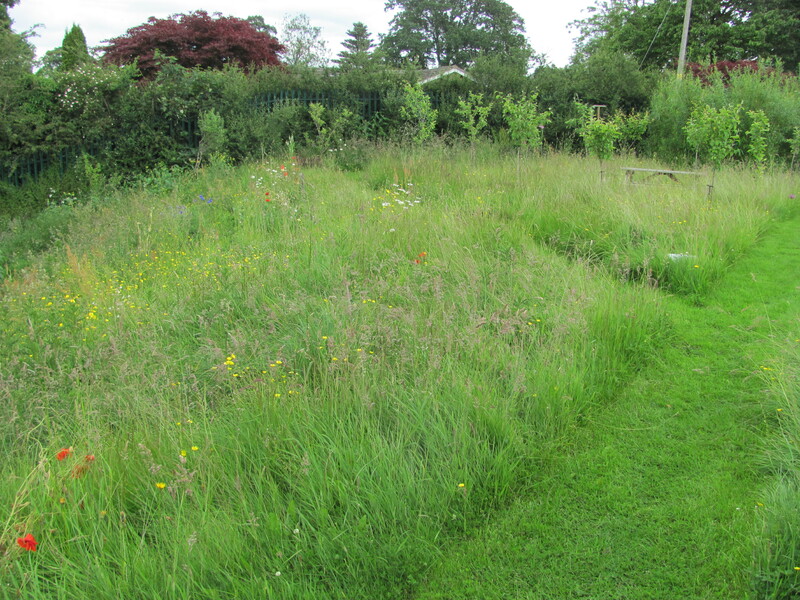 I shall finish with a shot of the plot we have nominated for this year’s Shrewsbury Town Allotment Competition and one of our grass spiral which currently looks most inviting. 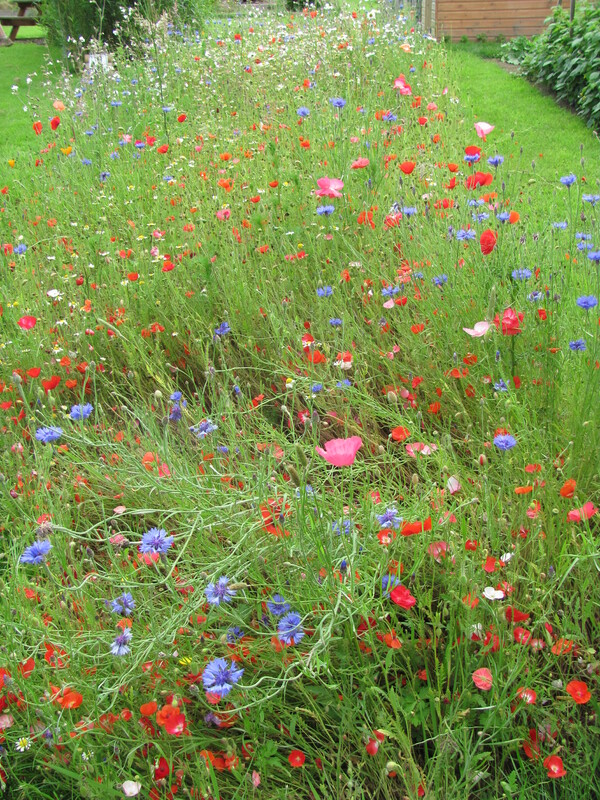 This entry was posted in allotments, birds, community gardening, conservation, fruit and veg, garden design, garden photography, garden wildlife, gardening, grow your own, hardy perennials, Land Art, meadows, natural pest control, ornamental grasses, ornamental trees and shrubs, outdoor sculpture, photography, poppies, roses, Shropshire, shrubs, spring gardening, wildlife and tagged allotments, birds, community gardening, conservation, David Austin, fruit and veg, fruit and vegetable growing, fruit., garden photography, garden wildlife, gardening, grasses, grown your own, insects, meadows, organic gardening, poppies, roses, wildlife. Bookmark the permalink. The meadows look lovely and the wildlife must be really thankful. 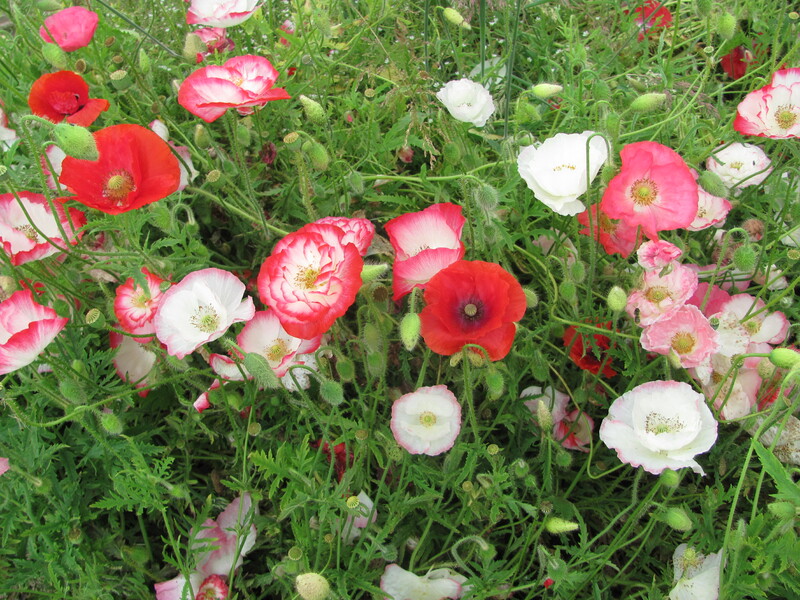 We were suprised by the mauve/dusky pink poppies that sprung up next to the wild red ones this year! It is an amazing year for poppies with new colours popping up unexpectedly. 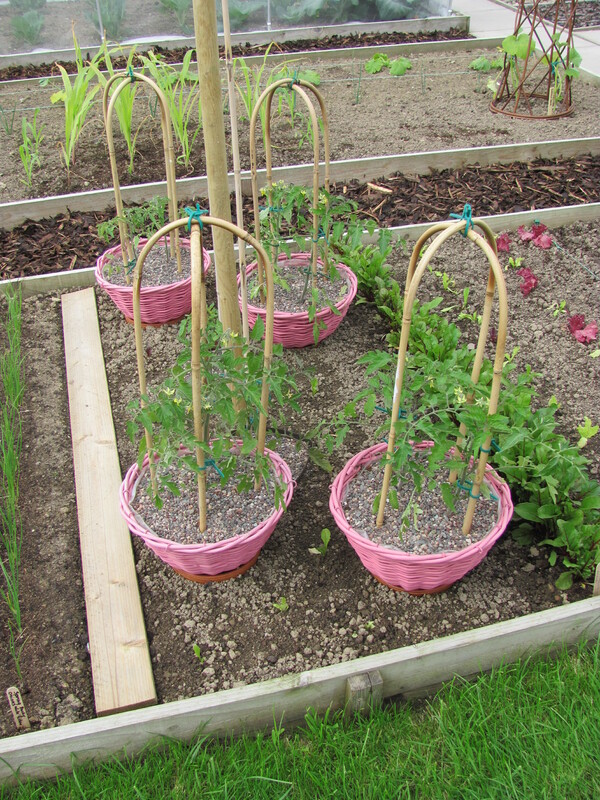 Lots of requests for seeds! This all looks lovely. I’m so happy to see your grass spiral. Very cool. 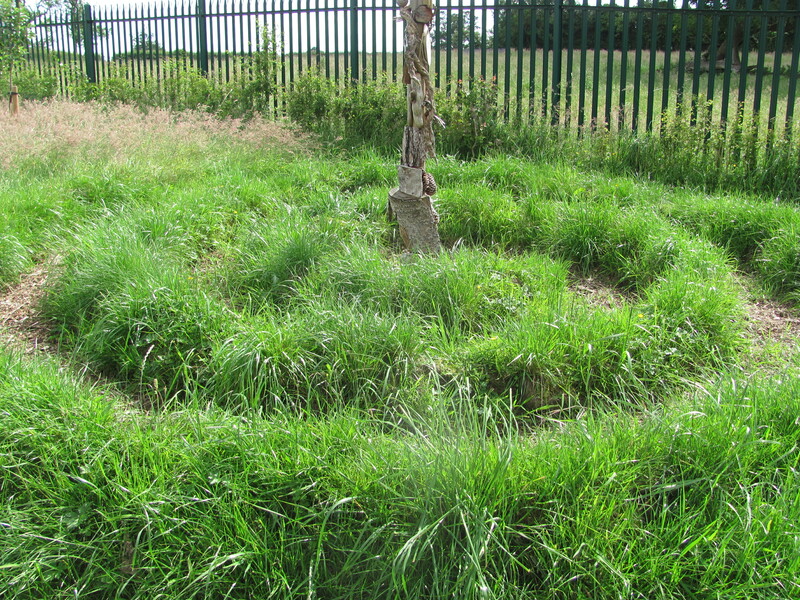 The spiral is a popular feature with the children. The nursery children who come to visit the site explore it in a long train of little people. Entertaining to watch especially when they reach the centre where they all turn around and shunt back out.